In 1927, a group of maritime leaders and professionals, like yourselves, gathered in New York to form an association committed to the enhancement and well-being of all interests of the maritime community on a national and international basis. They called themselves the Propeller Club of the United States. over 100 Propeller Clubs around the world. They are dedicated to aggressively promoting the maritime industry worldwide through many of its programs and partnering with other similar organizations. They meet as an international body annually in ports around the world. Click here to see the National Propeller Club website. We bring together the maritime community in its local port area to network and provide informative programs and social activities to its members. Local chapters in Tampa, Seattle, Baltimore, Houston, Piraeus, LA/Long Beach, New Orleans, and other ports are vibrant, visible organizations contributing tremendous value to its members. facing our maritime community in the New York port area. 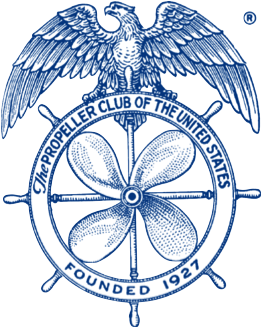 For these reasons, and the sheer joy of gathering as a community, we have revived the New York chapter, now known as the Propeller Club Chapter, Port of New York and New Jersey, a part of the International Propeller Club of the United States. President: Capt. G. Justin Zizes, Jr.